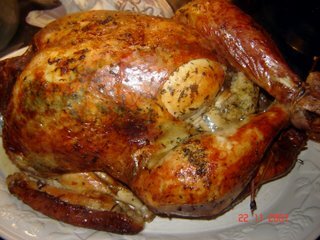 Anyone who came to the farm for our Harvest Fest last Sunday got to try some of the Blue Slate heritage turkey hens that we cooked in the wood fired oven, and they were amazing. Heritage breeds are typically smaller than their inflatable grocery-store counterparts, but where they lack in disgusting flabby mass pumped full of hormones and antibiotics, they make up for in flavor, unless you don’t consider the first thing to be a lack, in which case they’re just better. There is one thing, though, that the grocery store turkeys have going for them that most heritage breeds struggle with – moisture. A dry turkey is the regular bane of the thanksgiving table, mostly because cooking something that large is inherently problematic, especially when you have both dark and white meat to handle. Some chefs even recommend that you cut off the legs and thighs and cook them separately. There is another solution though, one that can make even the dryest heritage birds juicier than a big bucket of juice: brining. By leaving the bird in a brine overnight, you can not only get around the moisture question but also infuse it with all kinds of other tastinesses. That’s the solution that we used at harvest fest, and it worked like a charm. I made the brine that time, and due to incompetence and limited circumstances didn’t do it exactly right, but get the ideal recipe after the jump. Bring all the ingredients to a boil, and then add them to a gallon of ice water in a large enough container to fit everything – some kind of big bag, maybe? Add the turkey, making sure that it has brine on all sides, and then let it sit overnight. For those in New England, outside may suffice come late November, and for those elsewhere, hope it fits in your fridge. After that, just roast the chicken as you would have normally, depending on the size and your own preferences, then cut it up into small enough pieces to fit inside your mouth, chew, and swallow.